Beyond Borders Core Groups in the region work on the themes of ‘Identity. Diversity and Active Global Citizenship’ taking up different action areas based on local situations. 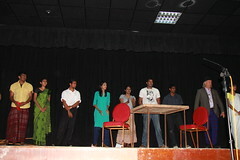 Since August 2005, when Beyond Borders core group was established, BB in Sri Lanka have been engaged in action projects related to peace and governance issues, citizenship, sexual health education and sustainable development issues through organizing workshops, seminars, open forums, training of trainers programmes and the use of forum theatre. In April 2006 we organized a youth festival which was attended by about 1000 young people in Sri Lanka and Beyond Borders partner countries. The festival consisted of skills building sessions, discussions and workshops as well as cultural components. As long-term projects we have conducted programmes on citizenship education for children in underprivileged communities, and a training of trainers programme for young school leaders on sexual health education and HIV/AIDS. On peace and governance issues, Beyond Borders Sri Lanka has organized several outreach workshops and seminars on conflict resolution themes. 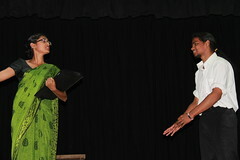 We have used the tool of forum theatre to highlight issues for social change. It has so far conducted four forum theatre performances – three on the theme of conflict resolution and one on the theme of HIV/AIDS. Additionally, we regularly hosts open forums on a range of issues ‘climate change’ and ‘globalization and cultural change’ being two recent ones. At present we have channeled our energies into several projects primarily on peace and governance issues including focusing on the ethnic conflict, citizenship education and experimenting with alternative media such as forum theatre. A report summarizing our activities (From January 2006 to April 2007) can be downloaded here. If you have any more queries, suggestions or think you want to get involved, please contact slbeyondborders@gmail.com. If you like what we do, Join us. Beyond Borders in Delhi is working on the issues related to sexual health and HIV/AIDS, democracy and the female feticide. At Present BB Delhi is working with Ideosync. Beyond Borders in Mumbai in the past has worked on training for kids with underprivileged backgrounds and working issues related to water. At present, BB Mumbai is working on am awareness-raising initiative for sexual minorities in Mumbai in partnership with Humsafar. In Dhaka, Beyond Borders groups work on Citizenship and life skills training for kids in underprivileged backgrounds including street kids and young people in special circumstances like the citizen-less residents of ‘Geneva Camp’. Currently the core group in Dhaka is in partnership with DemocracyWatch. BB in Pakistan operated as three core groups based in Lahore, Karachi and Quetta. They worked on issues related to Sexual Health Education, capital punishment and life skills training. BB in Pakistan is no longer active. Beyond Borders partnered with UK Youth Parliament, and collaborated in sexual health initiatives from 2004 to 2006.